You might imagine that everyone is online nowadays, at some point in their waking day. Well, it just isn't true, and for those people without internet access this can be a real problem. A great many services are online-only nowadays, or a fee is charged if you opt for a postal or telephone equivalent service. Most of the non-online people are over 65, which makes it quite hard to get the message across that the 'old way' of doing things is often the expensive or inconvenient way. It's easier thank you think to take your first click! To try and help people get online, the BBC has launched First Click, a media literacy campaign to encourage people to call an advice line and book themselves on a beginner's conputer course. Non-internet media (such as TV and radio) are being used to publicise the advice line, and this is a kay part of the strategy that people need to be approached - and not cajoled - using their tradtional communication channels, and have the benefits and requirements explained to them by a real human. To find a beginner's computer course, call 08000 150 950; calls are free from most landlines. Some networks and mobile operators will charge for these calls. 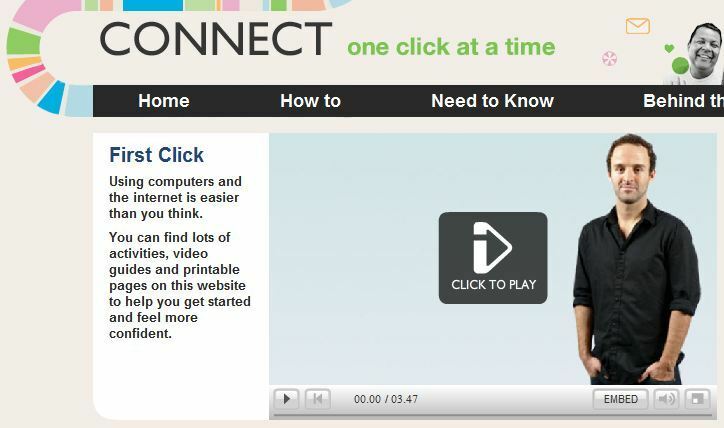 Once people do get online for the first time, or if they are using a friend's/relative's/public computer to try and learn more about it, one place they can go for a primer is BBC Connect: one click at a time. There is also an initiative called Get Online Week (18-24 October 2010) to help people get started with computers and the internet. If you think you know someone who isn't online but might benefit from it, check out Help Pass It On where the benefits of the Internet are explained and getting-started guides are available.